Last Thursday night, November 8th, 2018, our “Tiger Pride Cares” (TPC) of the Tiger Pride Alumni Association (TPAA), was awarded $3,650 dollars. 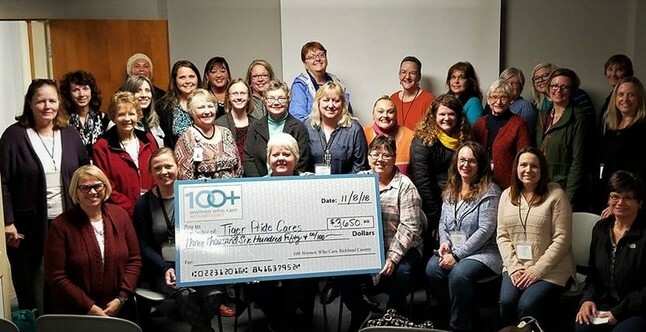 According to their website, “100+ Women Who Care Richland County” is a group of philanthropic women dedicated to making a positive impact on Richland County.” Three times each year the members select a local, non-profit organization to award helping support its public service program. Janet holding a check for $3,650! You active TAC members know that the Tiger Pride Cares (TPC) program aims to assist every RCCU#1 teacher in providing such things as toiletries, shoes, glasses, clothes/coats or lunch or school supplies or whatever. A key feature of TPC is its versatility: each teacher decides what situation to improve. The Richland County school district system has three schools: an elementary, middle, and high school, the three totaling a population of around 2,000 students. Based on both enrollment levels and usage levels last winter semester, the directors decided at this past September annual meeting to fund each school accordingly: $800 RCES (Elementary), $700 RCMS (Middle), $700 RCHS (High School). They wanted to make more funds available for the children in the middle school because RCMS had the most expenditures so far. The directors approved the plan last January for the past Winter 2018 semester of $2,000.00 with that sum split reflecting the different enrollment levels: $800 RCES, $500 RCMS, $700 RCHS. The total expense of the TPC program for that first semester was paid for by a special gift from our Tiger Pride Alumni Association’s Corporate Sponsor, Bob Lemke (ERHS Class of 1960).